As with anything on a house, original doors succumb to age and weather. Wood splits and splinters, moisture creeps into holes and causes rot, and the overall appeal of your entryway door disappears with the time. Instead of tolerating the nuisance of an old door, consider investing in a new one. 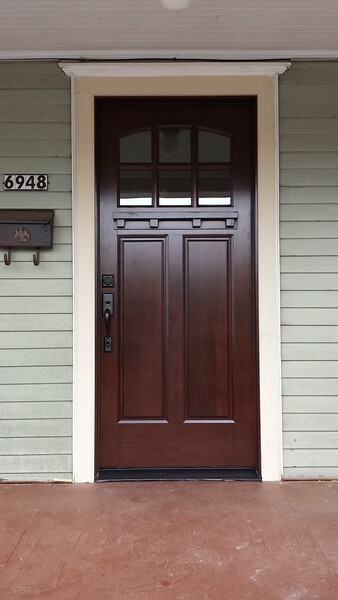 Here are three things you should consider before heading out to a company fit for great door replacement in Beaverton. These days, doors can be made with just about anything. However, not everything is made equal. Hardwood doors are a traditional option that remains popular for homes. For those living in areas that get hit by major storms, you might want to invest in a storm door to handle the harsh elements. Choosing the best material for your money is a good way to avoid making anotherreplacement later. A new door is not limited to a flat, bland hunk of wood, and not all of them are suitable for all homes and tastes. Instead of going for the cheapest available door replacement in Beaverton, consider how hardware and an appealing design can lighten up your entryway. Whether you want to let some light in from attached windows or just a cut-out design, your door and hardware options should accent you. Do not forget about the rest of the home when you head out shopping. An entryway should match the age of the house, or else you may just have an eye-sore on your hands. You want to choose a door that is flattering on the oldest or newest of homes. Before you decide on what your door replacement in Beaverton will look like, make sure you are going to work with a company that will suit your needs. Once you have satisfied this aspect, you can come home to a fresh new look that you deserve.